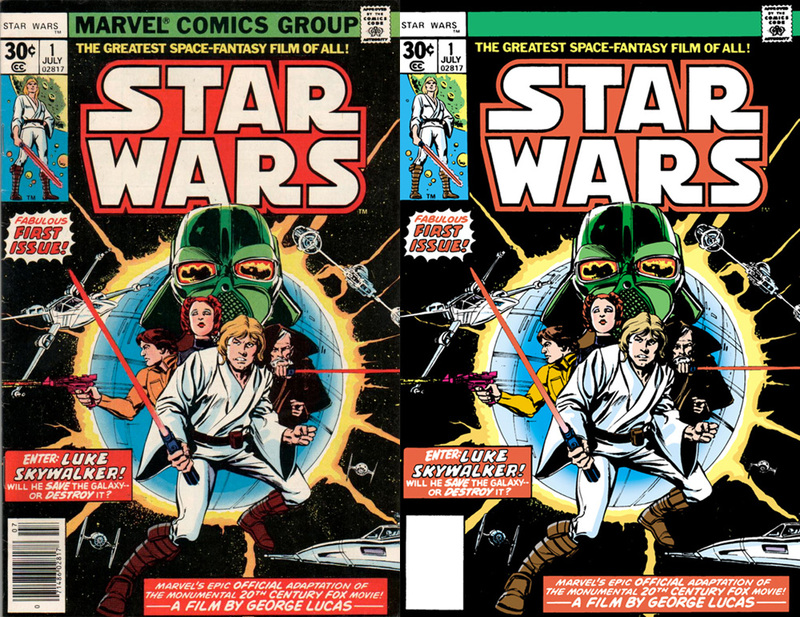 The first Star Wars comic books were published by Marvel from 1977-1986. To help promote his film, George Lucas granted Marvel the Star Wars rights for free. The first 6 issues illustrated "A New Hope," but after that creative new stories were told (most of which have been determined to be "non-canon" today). Dark Horse Comics picked up the Star Wars comics license in 1991 and has owned it ever since. Over the years, they've reprinted some of the older Marvel material, recoloring the material as needed. Probably to avoid trademark issues, these reprints have had their Marvel logos and other branding removed. There's even a case where the internal credits referenced Stan Lee, but now simply talk about Lucasfilm. One exception seems to be the cover of Issue #1, which features an art-based callout box at the bottom that still references "Marvel's epic official adaptation of the monumental 20th Century Fox movie!" Of course, now the ironic part is that Disney owns both Marvel and Lucasfilm, so they are all part of the same family these days!